Boatersland Marine > Boats/Boat Motors > Minn Kota Trolling Motors > Minn Kota RipTide SF Saltwater Bow-Mount Trolling Motors > Minn Kota Riptide SF 80 Saltwater Bow-Mount Trolling Motor 52"
Minn Kota Riptide SF 80 Saltwater Bow-Mount Trolling Motor 52"
Arm yourself with the ultimate weapon against saltwater. The Riptide SF features fewer moving parts, tighter tolerances, advanced corrosion protection and our revolutionary new Mono-Arm. You get no-nonsense power, stealth operation and rugged, reliable performance – everything you need to put saltwater in its place. Mono-Arm Design. Sometimes, the simplest solution is best. In this case, it’s a revolution. Riptide SF’s innovative Mono-Arm Design features an extruded, anodized aluminum, structural beam that operates with no metal-to-metal contact and 75% less torsion. A single hinge point and rear pivot bearing with 20% more surface area deliver less wear, longer life, and quieter operation than traditional motor mounts. Counter-Tension Stabilizer (CTS). CTS uses an integrated spring that applies force whether the motor’s stowed or deployed. On the water, that translates to a motor with no play, no give, reduced steering torque and silent operation. Removable Bowguard 360°. Lifting the motor and bowguard off of the mount is now even easier on Riptide SF – just remove a single cap screw. The patented Bowguard 360º also features a dual bearing system that eliminates noise and allows for improved breakaways from any angle. Push-to-Test Battery Gauge – Riptide SF. Get an instant “state of charge” with this easy-to-read gauge. 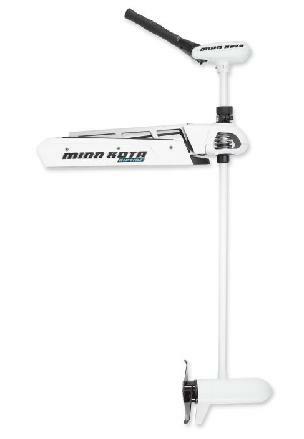 Minn Kota Riptide SF 80 Saltwater Bow-Mount Trolling Motor 52" | Minn Kota Riptide SF 80 Saltwater Bow-Mount Trolling Motor 62"